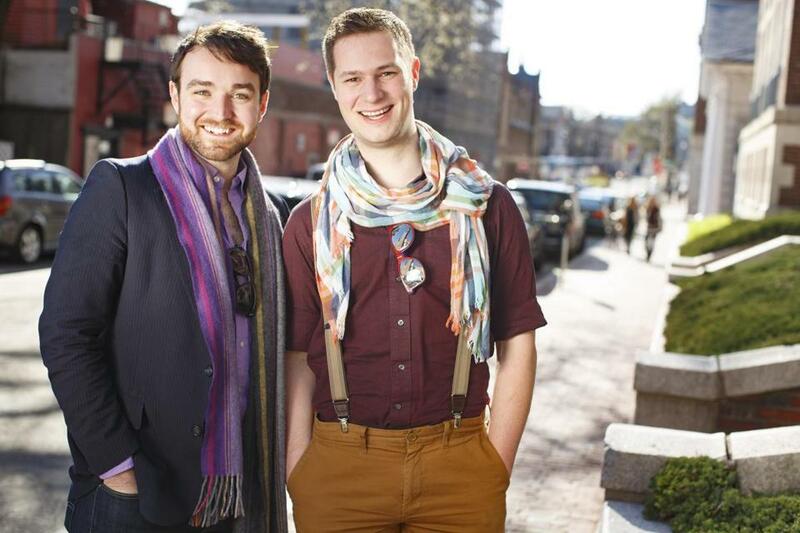 Charles Osborne (left) and Leo Hurley are the creators of "The Body Politic,&apos;&apos; a new opera about a transgender man from Afghanistan who moves to Chapel Hill, N.C.
CAMBRIDGE — Two years ago — when Caitlyn Jenner was still Bruce Jenner, Donald J. Trump was not yet a presidential contender calling for a temporary ban on Muslim immigration, and the words “bathroom bill’’ had not burst into the political lexicon — Charles Osborne and Leo Hurley created an opera about a transgender Afghan immigrant who faces isolation after he moves to North Carolina. Now, with the world premiere in Boston of “The Body Politic,’’ “we’re unwittingly catching the Zeitgeist,’’ said Hurley, a 26-year-old New Hampshire native. There’s nothing unwitting, however, about the duo’s next move. On May 19, Hurley and Osborne, also 26, will take their opera and its pointed antidiscrimination message directly to the heart of a raging controversy over transgender rights when they present “The Body Politic’’ at the State Legislative Building in Raleigh, N.C.
That is the same building where lawmakers touched off a national uproar in March by approving House Bill 2, which prohibits local governments from enacting laws that provide civil rights protections to gay and transgender people. Quickly signed into law by Governor Pat McCrory, the “bathroom bill’’ requires that transgender people use public restrooms that correspond with the gender listed on their birth certificates, not the gender with which they identify. Materializing at a time when transgender issues are rapidly gaining visibility, the law has triggered a fierce backlash while intensifying a debate over questions of gender identity and gender expression. On Wednesday, the US Justice Department weighed in, informing McCrory, a Republican, that the law violates the civil rights of transgender people, which raises the possibility that North Carolina could lose millions of dollars in federal funds. Already, the state is paying a price. Pay-Pal dropped plans for an expansion in Charlotte that would have yielded hundreds of jobs, and at least 20 conventions and events scheduled for the city were canceled, according to the Charlotte Observer. The law has been denounced by the heads of many large corporations, and the NBA, slated to host its 2017 All-Star Game in Charlotte, has expressed concern that “this discriminatory law runs counter to our guiding principles of equality and mutual respect.’’ Last month, Bruce Springsteen canceled a concert in Greensboro. All in all, a pretty dramatic backdrop for the young creative team’s first full professional opera production. Hurley and Osborne met at the University of North Carolina School of the Arts. Hurley, who composed the music for “The Body Politic,’’ has won awards for his string quartets and symphonies, and has written music for off-Broadway productions and for Maya Angelou’s 80th birthday celebration. Osborne, who wrote the libretto, is a playwright, actor, and director of theater and opera. Commissioned and developed by the Boston-based Juventas New Music Ensemble, “The Body Politic’’ is being premiered by Juventas through Saturday at the Plaza Theatre inside the Boston Center for the Arts. Though conceived well before the current debates — Hurley and Osborne first considered the general idea of an opera featuring a transgender character eight years ago — “The Body Politic’’ could hardly be more topical, with its settings that alternate between Chapel Hill, N.C., and Kabul, Afghanistan, and its sympathetic portrait of a young transgender Muslim man named Iphis struggling to fit in. Hurley and Osborne — a native of Charlotte who considers himself a proud Tar Heel — have sent invitations to the North Carolina performance of “The Body Politic’’ to the governor, the state’s attorney general, and all 170 members of the General Assembly. However, only one — Democratic minority whip Verla Insko — has told them she will definitely attend. A spokesman for McCrory did not respond to a Globe request for comment. Every Republican in the North Carolina House of Representatives and Senate voted for the bill, as well as 11 Democrats in the House. Hurley and Osborne aren’t naive about the power of politics, but they place considerable faith in the power of art to move hearts and change minds. “If we can get one North Carolina representative to root for a transgender Afghan Tar Heel, this show will have been a success,’’ says Osborne. In a telephone interview, Insko said she is urging her Democratic colleagues to attend the performance and expects a decent number to do so, though she doubts any Republicans will join them. Whatever the size of the audience, the performance of “The Body Politic’’ will make an important statement to policy makers and to citizens alarmed by what they see as a retreat from the state’s advances on civil rights, according to William Southerland, artistic director of the Greensboro, N.C.-based Triad Pride Men’s Chorus and an activist on LGBT issues.